This morning the Mermaid Sapphire steamed south of Falalop Island for two miles, turned west, and passed through Mugai Channel into Ulithi’s 212-square-mile (549-square-kilometer) lagoon. From the ship’s bridge we saw a magnificent reach of blue water 22 miles (35 kilometers) long and more than 10 miles (16 kilometers) wide. In the brilliant sunshine, under a steady east wind, the dark-green islets along its rim looked like they’d been torn from the pages of Robinson Crusoe and Treasure Island. 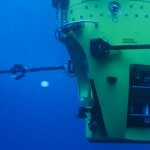 The crystal-clear ocean beneath the ship’s keel was 100 feet (30 meters) deep. Our objective was to steam north to the Urushi anchorage, drop anchor in the calm blue water, and let the 3-D film crew get “steady-ship” shots of the sub and launch-and-recovery teams working on the main deck. What do you do when you need a 60-pound (27-kilogram) 3-D camera hauled four stories up from the main deck to the bridge? Call the film crew. 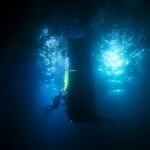 What do you do when you want a team in the Zodiac filming the DEEPSEA CHALLENGER going into a heaving ocean? Call the film crew. What do you do when the sub team, science team, and ship’s crew are having a late-night party and you have to record the festivities? Call the crew that never sleeps. They’re multitalented, tenacious, and tireless. Since we left Australia they have included Chris McHattie, John Turner, Aron Walker, Matt Green, Gwill Hewetson, Sam Winzar, Manning Tillman, Simon Christidis, Richard Kickbush, and Jay Hanrahan. Their director of photography is Jules O’ Loughlin, and their second unit director is Dr. Glenn Singleman. Academy Award winner and film director John Bruno is their leader. They’re the most physically active team on the ship. When you see them inside the hallways and stairways, in the high-noon heat of the main deck, on the rising and falling inflatable boat, or in a hot jungle clearing in Papua New Guinea, they’re usually carrying something—cameras, recorders, cables—and its always black and heavy. Stand next to one of them in the flaming heat as the sub is launched and you can hear the sweat pouring off his forehead. 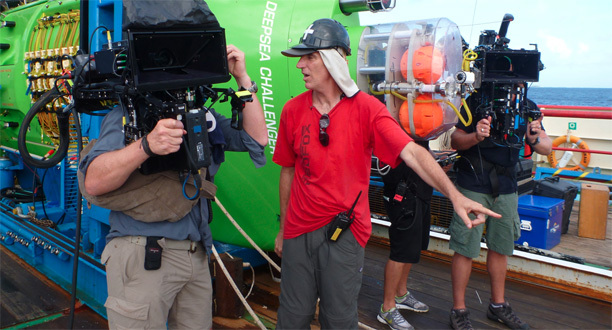 The film crew is the levity and musical center of the ship. On the seven-day sea voyage from Sydney, Australia, to Papua New Guinea, McHattie and Hewetson told stories and jokes that had the rest of us in tears. It was hot-zone humor at its best at a time when we needed it most. They’re blessed with an abundance of musical talent. When McHattie and Turner join forces with Garvin and Barkoczy, they rip the air open with flaming guitars. John Bruno and his team are driven by a singular mission: to record all the people, technologies, and moments—above and below the ocean—that have made up the DEEPSEA CHALLEGE expedition and turn these elements into a feature film and other media. After the last dive, the DEEPSEA CHALLENGER will be stowed, bags will be packed, and all of us will walk down the gangway of this fine ship. The only thing remaining will be the collective words, thoughts, and images—the story—of an expedition now slipping into history. It is the story of a man who grew up in a century transformed by science and became aware of the values and pitfalls of technology. It is the story of a man of Paleolithic persistence who took the fire of his imagination into the depths beyond the abyss, and in doing so redefined the meaning of exploration, broadening it, making it sing with scientific purpose. In telling this story, the film crew is creating the master “memory” of this expedition.